Compliance with global and local laws, rules and regulations is an important part of our mission statement SPIRIT. 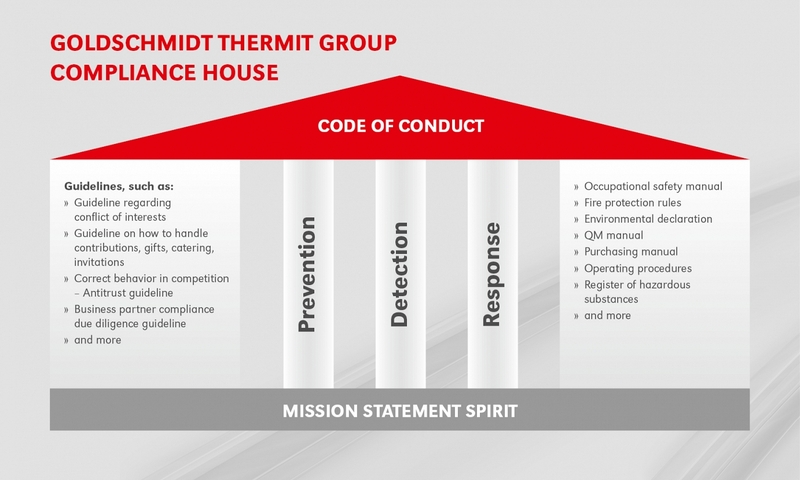 The compliance management system of the Goldschmidt Thermit Group includes basic rules for fair, open and honest conduct within the company group and also in connection with our business partners, customers and competitors. Our compliance management system helps to ensure that our business operations always correspond to the highest ethical, legal and professional standards. The responsible persons in the respective group companies combine their technical expertise and form together with the Group Compliance Officer a strong group-wide compliance network. Our compliance management system is based on three pillars- prevention, detection and response to compliance violations. 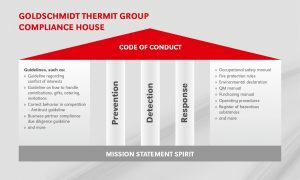 Our Code of Conduct includes our values, principles, code of behavior and rules for handling customers, business partners, colleagues, the community and shareholders with reference to the corresponding guidelines and regulations of the Goldschmidt Thermit Group and the relevant laws and regulations. Economic success and growth can only be sustained if the respective rules and standards are also maintained. This is our belief. The employees of the Goldschmidt Thermit Group stand for serious and honest behavior in everyday business. The integration of selected preventive and control measures in the existing management system serve to ensure compliance in our organization. The risk of misconduct can never be fully excluded, but we would like to minimize these as much as possible and to sharpen the awareness of our employees with regard to the ethically correct execution of their work.